""""The Radiance 2124, and Radiance 2144, add two component inputs, two composite inputs with 3D comb filter, two analog stereo inputs, one optical audio input, and three COAX audio inputs, plus a COAX audio output. """ This is what i find on Lumagens news page, but no where else can i find anything about 3D comb filter and Coax audio output. Is it possible to get some detailed specs about what comb filter, and pictures of the back plate to see the coax audio output. I need 96hz at 1080P and still have full controle of timing. Jim's promised for pictures on the backplates for us to use on our order page... these are forthcoming. If you have specific detailed questions (such as what comb filter is used), best to email Lumagen directly at support@lumagen.com as there may be some back and forth depending on the answers they provide. 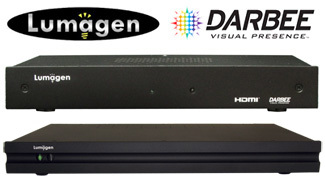 Feature wise, the Radiance 2020 is an upgraded version of the Radiance Mini: It includes twice as many HDMI inputs (4) and outputs (2), an expanded CMS (729 point instead of 125) for more accurate auto-calibration using software such as ChromaPure, and Darbee DVP™ image enhancement technology which allows you to adjust the amount of enhancement individually per input (similar to all other adjustments). All other video features match the current 21xx series. The Radiance 2020 has more memory and processing power as compared to the Radiance Mini, so we can expect that the performance and functionality will be increased over time as Lumagen has often done in the past with other models. At 11" wide, 5" deep, and 1.7" high, it is larger than the Mini but smaller than the 21xx series. For a complete breakdown of Radiance models, see our newly updated Radiance feature comparison table. Volume shipments start October 28. Free US/Canada shipping with tracking and insurance is included in all our Radiance prices. Contact us for international shipping. We ship worldwide. Heads up that that the Radiance Mini is SOON TO BE DISCONTINUED. Lumagen has a few in stock and does not plan to build more once they are gone. If you're looking for a low cost Radiance solution, now's the time to do it. TRADE UP TO A RADIANCE! Got an old video processor kicking around? Trade it in and save even more on a Radiance, over and above our already discounted CurtPalme.com prices! Contact us at lumagen@curtpalme.com for complete details. Please include the video processor model you are interested in trading in, and the Radiance model(s) you are interested in upgrading to. We will get back to you with options and trade in values. We have a very limited supply of high end Radiance 2144 units available for $2895 (MSRP is $4495). These are the models with 4K output. Price includes free shipping to anywhere in the USA or Canada (contact us for international shipping). These units have been completely refurbished, updated, and fully tested by Lumagen, and include the standard 1-year limited manufacturer warranty just like new units. They simply cannot be sold as new given that the boxes have been opened and/or the units were used during a quick demo. They still look and function as brand new. If you've been thinking about taking the easy road to calibration, now's your chance! Coupled with ChromaPure Advanced Auto-Calibrate, these Radiance video processors allow for extremely accurate automatic calibration (4913 point accuracy for the Radiance 2144). Anyone with little or no training can now calibrate their display completely automatically to levels of accuracy far beyond the standard 6 points normally done by hand. Click a few buttons and come back a few minutes later to your newly calibrated display. Advanced multi-point calibration is especially useful with today's newer digital displays and projectors (more information/pictures). The Radiance is also the perfect solution for a 2.35:1 (constant image height) setup without the need for an anamorphic lens. Supply is extremely limited. Once sold out these units will be gone. Free US/Canada shipping is still included on all Radiance orders. For international orders simply add the Radiance you're interested in to your cart along with the "Radiance International Shipping" option. The same deal applies to our new Auto-Calibration bundles. We've got a very limited quantity of Radiance 2020 open box units for sale. All of our open box Radiance units come with the same 1-year manufacturer warranty as new ones. They’re basically brand new, most have only been used for a few dozen hours if even that much – some will say that they’re actually better than new since they’ve had an extra few hours of testing. They are all cosmetically perfect, just can’t be sold as new. Prices include free US/Canada shipping (Additional international shipping charges will be automatically added at checkout). We've got a very limited quantity of Radiance XE pre-owned/refurbished units for sale. *PiP allows you to be able to watch two separate inputs at one time (one large picture with a smaller picture inside). PoP allows you to see two inputs side by side instead of a smaller picture inside of the larger one. The Radiance XE was the Consumer Electronics Association 2010 Platinum Video Product of the Year. These pre-owned units are customer owned trade-ins that have been completely refurbished and tested by the manufacturer. All include the same 1-year manufacturer warranty as new units. Up until a year ago we used industry standard power supplies (both 5V and 12V) with 50000 hour average life (5.7 years). In Europe with 240 VAC power surges (and it turns out Florida power surges too) could take them out but other than that they have been very reliable. 1) We stopped using 5 VDC power supplies for current products. This means that every component is isolated from the external power supply by an internal DC-to-DC power supply, which helps the unit tolerate a power surge if a surge gets through the external power supply. In the past, for 5 VDC units, we have had a power surge take out both the power supply and the unit. We believe using an external 12 VDC supply significantly reduces this risk. 2) All current Radiance units use a 12 VDC 5 Amp power supply with a average life rating from the manufacturer of 300000 hours. This equates to 34 years. While I can't be certain none have failed in the past year+ we have been shipping them, I can say I do not know of any failures with this new power supply. So the new ultra high reliability power supply has essentially eliminated power supply failures for the past year+ of sales. Of course at some point one or more will fail but the failure rate is expected to be very low. We have always had a very low failure rate for Radiance units, including power supplies, other than accidental damage (which includes power surges). The new 12 VDC only supply voltage and 300000 hour MTBF power supplies will improve this even further. The ideal video processor for your new 4K projector or TV! Contact us for trade-ins and the guaranteed best price at lumagen@curtpalme.com. 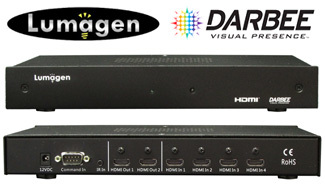 The Radiance Pro features up to 8 HDMI inputs, 4 HDMI processed outputs, and 6 HDMI switched (unprocessed) outputs. All inputs and outputs support 4K Ultra HD (2160p60) and the newest HDMI standards (HDMI 2.0 / HDCP 2.2). - Radiance Pro 4440: 2 inputs and 4 processed outputs. - Radiance Pro 4442: 4 inputs and 4 processed outputs. - Radiance Pro 4444: 6 inputs and 4 processed outputs. - Radiance Pro 4446: 8 inputs and 4 processed outputs. - Radiance Pro 4449: 8 inputs, 4 processed outputs, and 6 switched outputs. For complete details see our Radiance order page and newly updated feature comparison table. US/Canada shipping with tracking and insurance is included in all our Radiance prices. International shipping available too with a surcharge at checkout. We ship worldwide. In reference to the new Radiance Pro, on Lumagens product page they are showing the internal Darbee VP unit as still only able to process a 2K picture. Any word on the status of any upgrades or new separate models becoming available since although it can process an upscaled 4K picture, the 5000(which I currently own) has been phased out and replaced by the 5000S which is difficult to find and still doesn't seem to be purely 4K compatible. I'm told that the Darbee processing the Radiance will almost certainly be limited to 1080p. Lumagen has an agreement that should they do 4k that Lumagen can use it, but it likely would be too big to fit in the Pro FPGA, and that the feelings are that Darbee will likely not be doing the work for 4k. Based on the Radiance Pro 444X design, but with less I/O capability, the two new units are the Radiance Pro 4240 (2 inputs, 2 outputs), and the Radiance Pro 4242 (4 inputs, 2 outputs). Both of these units come in 1U (17" by 2" - or 1.75" without feet - by 9.5") cases and are the same size as the Radiance 2143 and RadianceXS-3D units. - Radiance Pro 4240: 2 inputs and 2 processed outputs. - Radiance Pro 4242: 4 inputs and 2 processed outputs. The new 424X series uses the same FPGA, and have all the video processing features of the 444X models, except they will not support PiP/PoP (there is a planned future PiP/PoP upgrade for the 444X models). By keeping the input count to a maximum of four and the output count to a maximum of two, the 424X models allow for some cost reduction compared to the 444X models. The Radiance Pro 4240 has a USA retail price of $4995 and is perfect for systems that use a matrix switch for input selection, or switch sources using an AVR. The Radiance Pro 4242 has a USA retail price of $5295 and works well as the source switcher for smaller systems. The 424x models use the same dual-input, and dual-output, daughter card I/O modules as the 444X models and so currently support 9 GHz I/O. Radiance Pro 424X hardware is at production status, and software is in Beta. Effective immediately, purchase a Radiance Pro video processor to get our advanced auto-calibration package for only $280. That's more than a $500 savings! This is our most popular automatic calibration package and includes ChromaPure Standard, Advanced Auto-Calibrate, and a Display 3 PRO meter. Discount available for a limited time only! We ship worldwide. Automatic calibration allows anyone with little or no training to fully calibrate their display with almost no user input. It adjusts the display's grayscale, gamma, and colours to levels of accuracy that are simply not achievable by manual methods. Just setup a few simple options in ChromaPure software, click "Auto-Calibrate", and then go have a cup of coffee while the process completes, usually in a few minutes. There is no need for the user to understand how calibration works. Suitable for all display types. Previously, calibration required the user to adjust their display manually while ChromaPure software read the results using a meter. The user would loop through displaying test patterns, reading the results, and making adjustments, until the results were as close to accurate as possible. These calibration steps are outlined in our free step by step guide. Requires the user to have access to typically hidden (service menu) controls in the display. Displays often have limited adjustments that do not work correctly, or are cryptic. Displays often have only 1 gamma adjustment, if any at all (compared to up to 21 points with auto-cal). Displays often only have only 2 greyscale adjustments, if any at all (compared to up to 21 points with auto-cal). Manual calibration of colour (gamut) is typically only done at 6 points, if the adjustments are even available (compared to up to 4913 points with auto-cal). Time consuming. Manual calibration requires the user to interpret the meter readings and make the necessary changes in the display. Our free step by step guide is a step in the right direction, but the process is still manually driven and can take hours, especially for someone new to the process. All of these can result in a less than perfect calibration. Only automatic calibration, done outside of the display, can compensate for these issues. How does automatic calibration work? Automatic calibration is an optional add-on to ChromaPure software, and it works in conjunction with a Lumagen Radiance external video processor. The processor acts as both a test pattern signal generator and calibration device. ChromaPure tells the video processor to display test patterns, measures the results with a meter, and then tells the video processor how to adjust the signal to compensate for display errors. This cycle repeats (often for thousands of test points) until the measured results are as close to perfect as possible. Once completed, the video processor stays in the signal chain permanently, constantly adjusting the signal in real time to keep the display perfectly calibrated. ChromaPure evens generate a before and after calibration report for you. Why does the number of calibration points matter? When using a Radiance video processor, calibration of up to 4913 colour points can be done achieving unparalleled colour accuracy. Instead of manually colour calibrating to only the 6 primary/secondary colours that make up the boundary of all known colours (called the gamut), we can calibrate throughout the entire colour space by measuring and correcting up to 4913 colours. Only calibrating at the boundries (as is done with manual calibration) can still leave many inaccuracies (see real life example). This revolutionary level of calibration accuracy has only been made possible by recent advancements in processing power found in the Radiance family of video processors. Manual calibration at thousands of points is simply not possible because displays do not have look up tables (LUTs) in which to store the correction information. Even if they did, manually calibrating to thousands of points would quite litterally take the user weeks to perform. Which Radiance Pro is right for me? Radiance Pro units all offer the same world class image processing. They mostly differ by the number of inputs and outputs. For complete details see our Radiance feature comparison table. The Radiance Pro is regarded as the world's best video processor/scaler, with advanced Greyscale & Gamma correction, and a powerful Colour Management System (CMS). A requirement if absolute picture perfection is to be achieved. All units support 4K UltraHD, HDR, optional 18Ghz inputs, and HDMI 2.0 / HDCP 2.2. US/Canada shipping with tracking and insurance is included in all our Radiance orders. International shipping available too with a surcharge at checkout. We ship worldwide. For a complete breakdown of how the Radiance 2020 compares to other models, see our Radiance feature comparison table. Manual calibration of colour is typically only done at 6 points (if the adjustments are even available). Automatic calibration is done at up to 4913 points for greatly increased accuracy. Manual calibration is time consuming. Manual calibration requires the user to interpret the meter readings and make the necessary changes in the display. Our free step by step guide is a step in the right direction, but the process is still manually driven and can take hours, especially for someone new to the process. Once completed, the video processor stays in the signal chain permanently, constantly adjusting the signal in real time to keep the display perfectly calibrated. ChromaPure evens generates a before and after calibration report for you. When using a Radiance video processor, calibration of up to 4913 colour points can be done achieving unparalleled colour accuracy. Instead of manually colour calibrating to only the 6 primary/secondary colours that make up the boundary of all known colours (called the gamut), we can now calibrate throughout the entire colour space by measuring and correcting up to 4913 colours. Only calibrating at the boundaries (as is done with manual calibration) can still leave many inaccuracies (see real life example). This revolutionary level of calibration accuracy has only been made possible by advancements in processing power found in the Radiance family of video processors. Manual calibration at thousands of points is simply not possible because displays do not have look up tables (LUTs) in which to store the correction information. Even if they did, manually calibrating to thousands of points would quite literally take the user weeks to perform. Looking at buying the Radiance Pro 4242. I have a Panasonic EZ1000 OLED coming. I think most of my sources will be 1080p (nothing Samsung). 18 GHz allows you to set Samsung UHD sources to output HDR at 10-bit at 4k24 since they did not support 4:2:2 at 9 GHz. Also allows support for 4k60, 8-bit, 4:4:4. (Normal 9 Ghz inputs support 4k60, 8-bit, 4:2:0). Two outputs are affected: One is upgrade to 18Ghz audio/video while the second remains audio only. I'm presuming the upgrade from 9 to 18Ghz is better, but why? Does that allow 4:4:4 output (rather than 4:2:2)? I see there is a tradeoff for the 18Ghz card in that one output can only do audio. Ok found an explanation here which explains Chroma Subsampling, so that just leaves a few questions about the input & output cards. It seems 4:4:4 is better than 4:2:2, but not a big deal according to the site below. 18 GHz allows 4k60, 4:4:4, 8-bit, or (what would be a better choice IMO) 4k60, 4:2:2, 12-bit. The later better supports the HDR requirements for 4k60 HDR sources since it is >10-bits. Set-top boxes and some players/streamers prefer 4:4:4 output. Most will upgrade one input and one output card at the time of the order. You may do so any time later too, but it's a bit more expensive and the old 9ghz card needs to be returned (if not returned it's a considerably more expensive). Contact me at kal@curtpalme.com for pricing details for doing this down the road. Swapping them yourself only takes a screwdriver. I have instructions if you're curious. These ship worldwide, direct from the manufacturer. Lumagen has decided to transition to a 1U (1.75" height) case for all Radiance Pro products, so they have introduced Radiance Pro 444X-1U models. The 2U (3.5" height) chassis will remain the standard model until stock is gone. If you prefer a 1U version, let us know at the time of order. Note that the 444X-1U video processing features and video quality remain identical to the Radiance Pro 444X 2U chassis models, with only the case and fan changing. The current 2U version of the Radiance Pro 444X models uses a 35 mm fan running at 7500 RPM (max). Some people have been asking for a quieter version of these models and this is in part the reason for updating the case design to 1U using a 60 mm fan. The Radiance Pro 424X models currently use a 60 mm fan that is quieter than the 444X’s 35 mm fan since it spins slower at 2500 rpm (max). The new 444X-1U models will use a new, even quieter, 60 mm fan that is rated at 3 dB less than the current 60 mm fan used in the Radiance Pro 424X models. In addition the 444X-1U will use "voltage control" for fan speed rather than pulse-width-modulation (PWM) used in the 424X, and current 2U 444X models. This further reduces the fan noise level. One question we get from installers using 19” racks to mount equipment is “do we need to leave a space above or below the unit for ventilation?”. The 444X 2U models have inlet and outlet venting on the back and so only required 2U rack height to be allocated in the rack. The 424X (1U) models require 1U above and 1U below for ventilation, and so require 3U spacing (unless there is smaller equipment above and/or below such that the vents have adequate air flow). The new 444X-1U requires a 1U space below the bottom vent, but can be used with no space above since there are outlet vents on the back in addition to the ones on the top. So the 444X-1U requires 2U vertical space in the rack. As always it is recommended that the Radiance Pro not be installed above heat generating equipment such as power amplifiers.